Pistachio nuts are a favored snack and cooking ingredient, especially among healthy dieters. They are small and oval in shape, with a light colored shell that splits open on its own. Meanwhile, the flesh inside has red or green color. Pistachios are available still in their shells, or unshelled, and are one of the healthier nuts available, according to HealthyEating.SFGate.com. The nuts come from pistachio trees, which grow best in dry climates, and are dormant in the winter. In the United States, southern California deserts produce 98 percent of pistachio nuts, while the rest come from Arizona, New Mexico, and west Texas, according to HomeGuides.SFGate.com. Around the world, pistachios come mainly from Iran, Syria, and Turkey. Pistachio nuts are as nutritious as they are delicious, and have quite a lot of medicinal uses. Pistachio nuts are great for the heart, with regular consumption shown to lower the bad LDL cholesterol in the body, according to OrganicFacts.net. At the same time, the combination of antioxidants, unsaturated fatty acids, and phytosterols all support heart function. At the same time, pistachio nuts can reduce age-related macular degeneration through antioxidants like lutein and zeaxanthin. The antioxidant properties of pistachios also enable them to fight against free radicals, therefore being effective as a cancer prevention measure. They can also keep the skin moisturized, due to the amount of saturated fat it contains. Pistachio nuts are a great source of dietary fiber, ensuring smoother food digestion, and preventing bowel problems such as constipation and diarrhea. 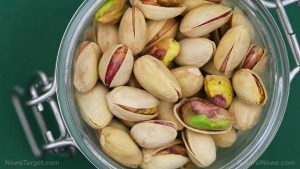 A study has found that pistachios also enhance sexual vitality, particularly in men, who were shown to have better erectile function after taking 100 grams of pistachios daily for three weeks. Pistachios can be effective against anemia, improving the absorption of iron into the body, due to their high copper content. They are also great for managing diabetes, reducing the glycation process through its antioxidants. They are also helpful in managing weight, as they are low in calories and saturated fat, but high in protein. Pistachios have a specific flavor, all at once sweet, nutty, and with a tangy hint. It is a culinary chameleon that can be added to most dishes. Based on recipes from OneGreenPlanet.org, pistachios can add a special texture to curries and can also be baked into bread or cookies. When crushed, they can be used to crust meat dishes, and when ground, they can be mixed with chickpeas to make a nutritious falafel. Pistachios also work well with pastas, cereals, and on their own. Pistachios boost heart health and reduce levels of LDL cholesterol in the blood. They reduce the risk for age-related macular degeneration. They can help improve erectile function. Pistachios ensure better digestion, preventing diarrhea, and constipation. They can help prevent anemia. They are effective in managing diabetes. Pistachio nuts help with weight control.